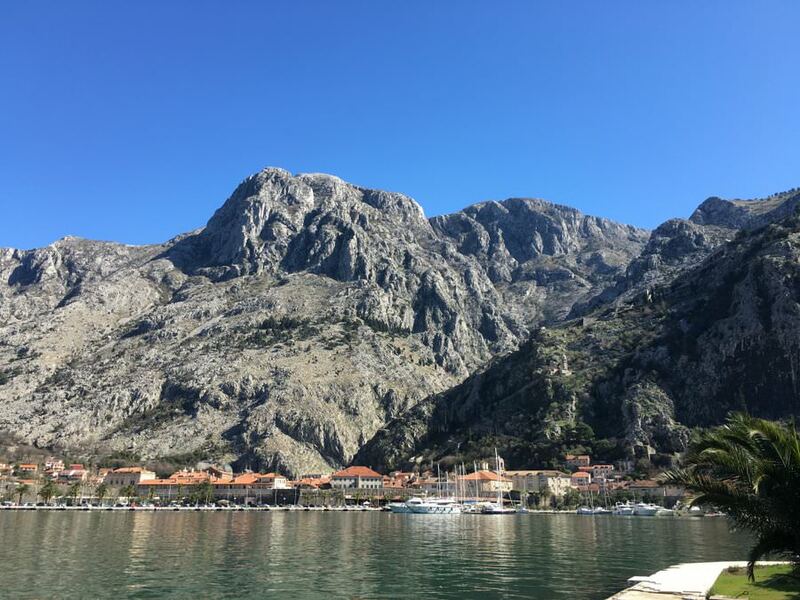 It took us about three hours to drive from the fairytale city of Dubrovnik in Croatia, to yet another magical place, Kotor in the small country of Montenegro. As soon as our little car rounded the bend and into the bay, we were in awe of the postcard-perfect landscapes. The bay, which is also known as the Boka, is dotted with little villages, and is backed by towering, rocky mountains. This area is compact and the best way to see it is to pick a base and do day trips from there. 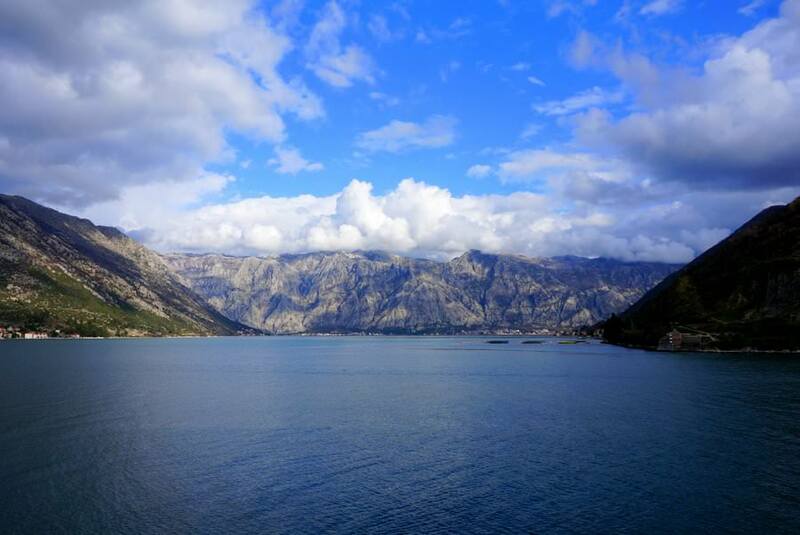 You could easily spend a couple of weeks at the Bay of Kotor, exploring all of its natural beauty and historical sites. We chose to base ourselves in the old town of Kotor and because we had a rental car, we could head out each day to visit the nearby towns. Unfortunately, our car mostly sat in the parking lot! Basically the entire time that we were in Montenegro, it rained…and I don’t mean that it drizzled, we experienced torrential downpours. Because the bay is backed by such grand mountains, the clouds just seem to get “stuck” and rather than blowing through, they hang around in the bay. This is what it looked like when the clouds parted! Stunning. During the rainy days, we hung out in the common area of our hostel with other backpackers, while drinking wine and waiting out the storm. Not that there’s anything unfortunate about drinking wine and meeting other travellers, but we would have preferred to be out exploring the area. 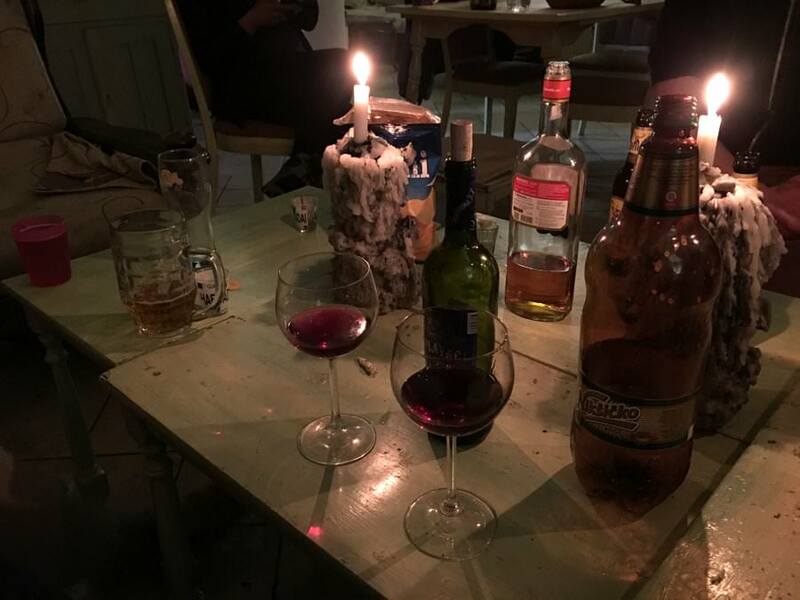 We felt a bit old at this hostel – red wine & wine glasses for us, cheap beer & whiskey for the youngsters! When the clouds would part, even if just for a couple of hours, we would run outside and see all that we could! Kotor itself was absolutely incredible. The old town is fortified on all sides, and even though the backside of the town is protected by a massive rocky mountain, there is still a stone wall which runs along the hill, creating an extra layer of security I suppose. How people were able to create such a vast wall on such steep terrain in the 9th century is beyond me.